Registering on myOpel comes with many benefits for you. Telling us about you and your Opel helps us in offering you tailor-made services and products. Don’t hesitate and become part of the Opel Genuine Service experience to fully enjoy the many benefits of your Opel vehicle. To learn more about myOpel click here. Your password should be a minimum of 8 characters, including at least one capital letter and at least one number. Where do you know us from? By Registration you accept the Terms and Privacy & Cookies Policy. You agree that Liberty Automobiles Co, General Motors Holdings LLC (Michigan USA) and OnStar Europe Ltd. may process your personal data for marketing, market research, tracking sales data and to contact you. On request you can stop the processing of your personal data for marketing. Here u have the possibility to enter ur Social Security Number. Thanks for your registration on myOpel. You received an e-mail to the address you have entered. Please activate your account by clicking on the link in this e-mail. Enjoy your visit on myOpel! Are you a fleet vehicle driver? Your vehicle has been identified as a fleet vehicle. Would you like to register as a business customer and see Opel4Business related content? We were not able to recognize this vehicle as belonging to a fleet. 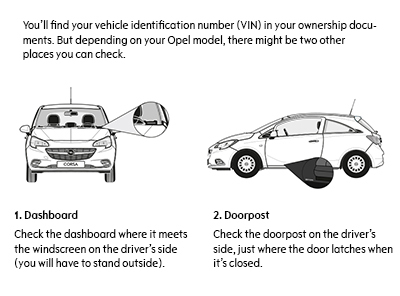 Please check your vehicle identification number spelling or register as a private customer.